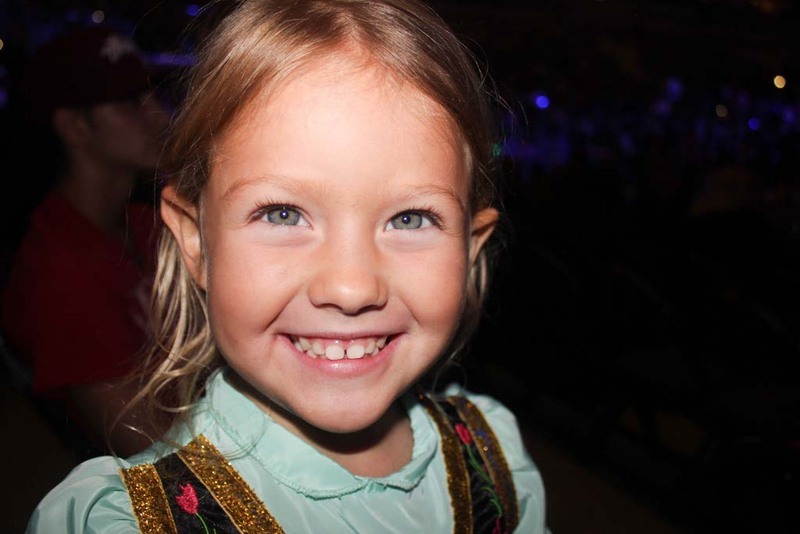 Every little girl in North America loves Disney’s Frozen. It’s undeniable, especially on Halloween when there are more Elsa and Anna costumes than witches and ghosts. 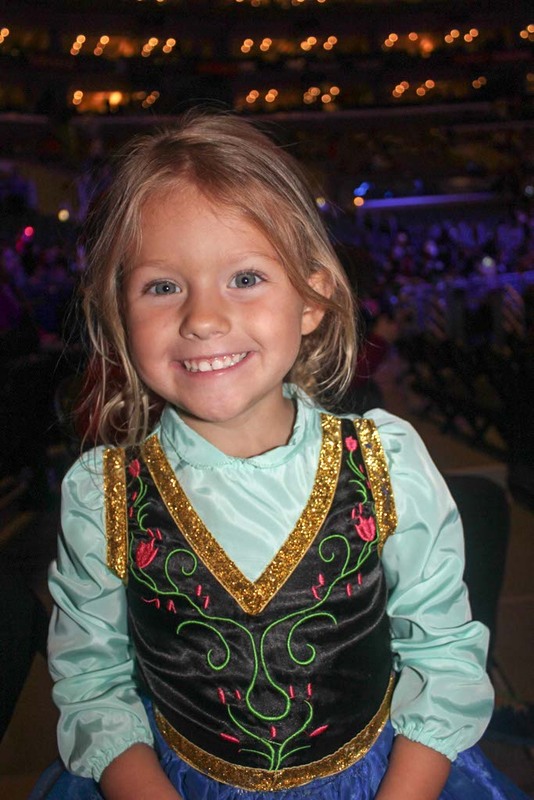 So when I heard that Disney on Ice was presenting Frozen it was immediately a must on our family bucket list. Athena dresses up daily as Elsa and Anna and has more than a handful of costumes to choose from. It wasn’t a question of if we were going but how many times. Tonight we witnessed it for the first time and the smile on Athena’s face said it all – it was magical. Disney On Ice – Frozen will be performed at the Honda Center in Anaheim next week but I was too excited to experience it with Athena so we went to the performance at the Staples Center in LA tonight. Athena was talking about it since she woke up this morning. She laid out her favorite Elsa costume and asked question after question about which characters would be there and what songs they’d sing. By the time we arrived at the Staples Center, she was exploding with anticipation. 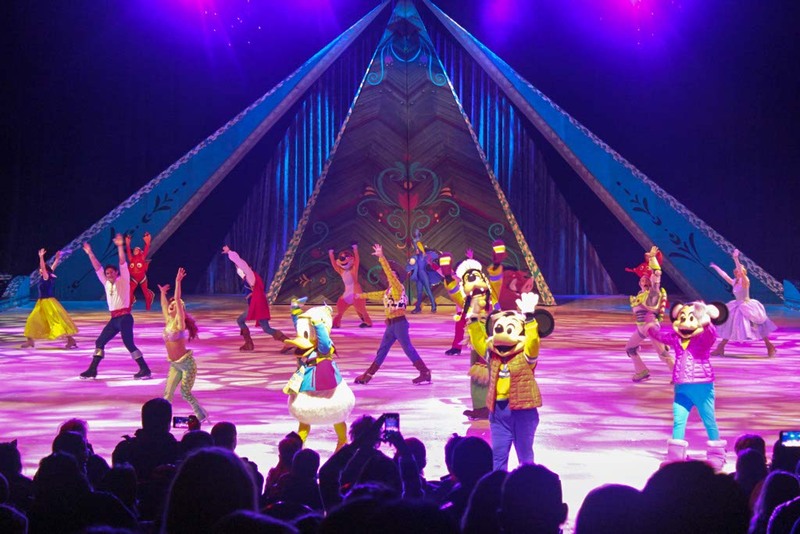 The show opened with Mickey and Minnie and special appearances by many of the Disney Princesses along with other favorite Disney characters like Nemo and Timon and Pumbaa. They sang a snowman song with a few simple steps and we were both out of our seats dancing in the isle. It had only just begun and I was already impressed with the agility of the skaters and the participation of the audience. Athena was actively involved and that always makes for a more entertaining experience. When Elsa and Anna appeared on the rink, the level of enthusiasm in the crowd went through the roof. Young kids were up on their knees to see better. Toddlers wiggled in their seats with excitement and even adults were completely focused on the ice. Although some of the scenes were changed from the movie to make it work better on ice, most of our favorite songs were part of the show. Watching Athena sing along is one of the greatest joys in my life. She is growing up so quickly and her memory for music and songs is shocking. I’m very proud of my little girl and I’m not embarrassed to sing along with her. That’s one of the best parts of being a mother. You no longer need to worry about doing something embarrassing. You can justify it because you are there with your child. 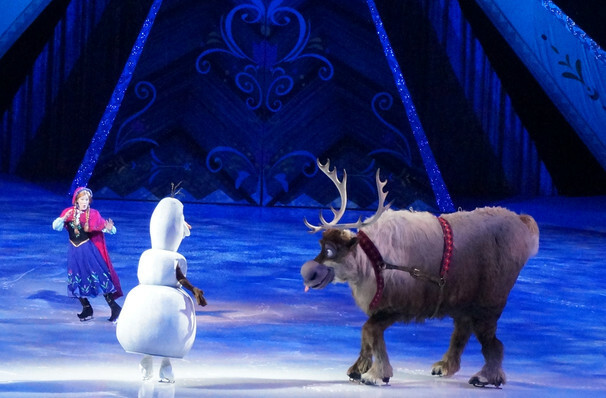 One of my favorite moments of the evening was when Kristoff and Sven came on the ice for their opening performance. Kristoff was fantastic and I was impressed by his back flip and spins. (He stole the show in my eyes.) Athena loved Sven and he was just as goofy on stage as on camera. Another great part of the production was when “Marshmellow” came on the ice and was chasing Olaf, Kristoff and Anna. The creation was massive and the way it slowly blew up while moving around made it seem alive. I’m still wondering how Sven and Olaf moved so easily on the ice with such huge costumes and how the rocks rolled out onto the ice during the troll scene is a mystery as well. 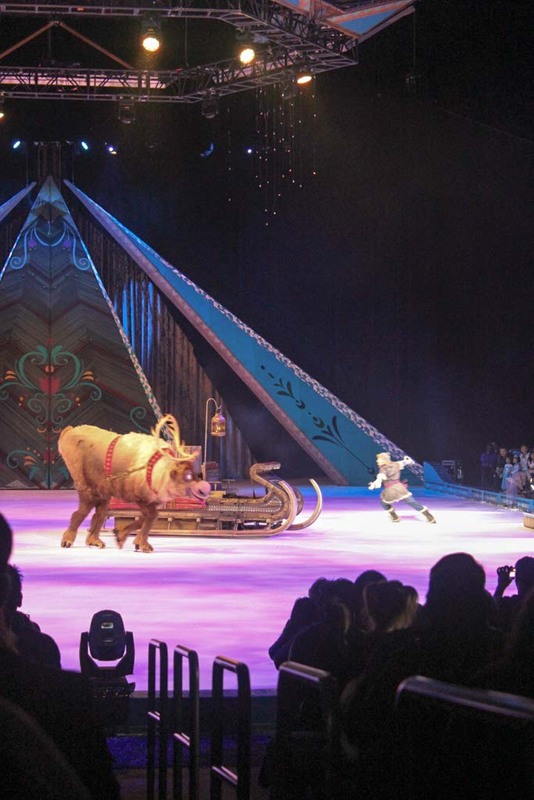 Although Disney On Ice – Frozen is clearly a production for children, I truly enjoyed it as well. The singing and dancing gets you in the holiday spirit and the smile on Athena’s face warmed my heart. Kids love Frozen. Rather than watching the movie for the 700,000th time, it was a welcomed change to see it performed on ice with a few “twists”. Am I willing to go again in Anaheim next week? Let’s see how Athena behaves tomorrow after getting home at 11 pm and I will decide but after such a great evening together, I’m actually considering it. Thanks to Disney On Ice for the complimentary tickets for review. All opinions and believes are, as always, my own. 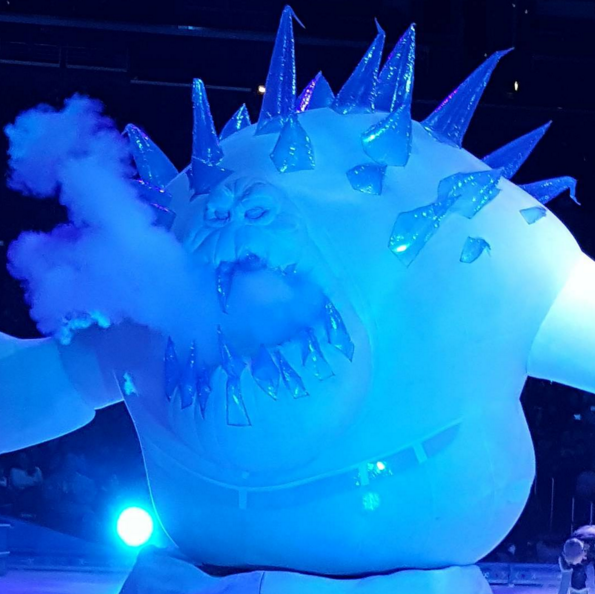 This entry was posted in California, California Entertainment, Family, Family Travel, USA and tagged California, Disney, Disney On Ice, Family, Frozen, LA, Staples Center, travel by lesleycarter. Bookmark the permalink. How fun! I raised boys and went through the Aladdin costumes for Halloween. But, here in Hawai’i we seldom have ice shows. Athena looked enchanted. Do they have a skating rink on your island? Here in SoCal they make fake ice but it’s still fun. We’re going to go skating this weekend. Thank you! She’s full of so much joy. It’s contagious. Leslie, that is one huge smile on Athena’s face. So happy, it makes me smile just seeing it. I’m wondering who this bucket list you are working on here. What a wonderful beginning to a magical season. Great post. Its not only Mums that can share the magic. I’ve found that, at the age of 63, I can get away with reverting to a child as long as I have one of my granddaughters with me. Merry Christmas to you as well. I hope it’s filled with joy and laughter. have you been decorating for the holidays? She has Down’s Syndrome, so chronologically she is 14. What a magical evening!!!! I love skating shows and this one looks amazing!! So glad you had a great time. I can just picture the 2 of you singing!! What fun! I’d love to see it! What fun for the two of you and what a memory of the two of you, for her later, when she’s all grown up! Athena’s smile says it all! Looks like a great show and so happy that you got to experience it.